Extract: What innovations are on the horizon from Microsoft that apply specifically to your customers in the oil and gas world? There are a number of things that I’ll highlight. Cloud computing is No. 1. It’ll be a big deal to all enterprises. It’s particularly a big deal in an industry like oil and gas where there’s so much data involved and so much need for computing, and having elasticity on those things is helpful. There’s so much collaboration that spans company boundaries today — the way the service companies work with the oil producers and the way the oil producers work with one another in partnerships and joint ventures. It’s an environment where people want to share information across organizational boundaries in unique ways. The cloud allows that. It drives cost out and drives agility. When we think about offerings like our Windows, our SQL Azure, our SharePoint online offering, I see huge potential applicability specifically for these cloud-computing technologies in this energy industry. That would be number one. Steve Ballmer joined Microsoft in 1980 and became Chief Executive Officer and President in January 2000. 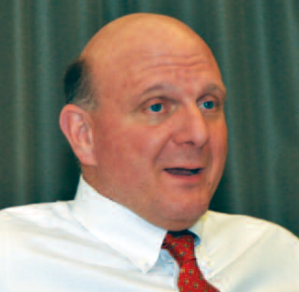 Download: Steve Ballmer shares his vision.